Arnout wrote, "For what it's worth, I was stationed in Germany from 1960 to 1963 in the U.S. Army as a enlisted solider. When I arrived in southern Germany, enlisted men could have cars. However, an order went out that only sergeants and above would be allowed cars. I ran downtown and bought the first car I could find to beat the order, which turned out to be about a 1951 Mercedes-Benz taxi-cab. After a year, the engine gave out. Editor's Note: The W187 Type 220 was built from 7/51-5/54. It was available in four body styles: 4 door sedan, cabriolet "A" (convertible coupé, 2 passenger), cabriolet "B" (convertible coupé, 5 passenger), and coupé. It had an overhead cam 6 cylinder gasoline engine of 2,195 cc. It could develop 80 bhp and weighed 2,970 lbs. The wheelbase was 112 inches. Daimler-Benz produced 16,154 sedans and 2,360 of the other body styles. 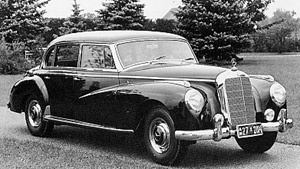 The W187 Type 220 should not be confused with the Mercedes-Benz Ponton Type W180 220a sedans built from 3/54-4/56. The camera I used to take the photo of the 220 sedan (while on leave in Switzerland, France and Spain) must have been a 35mm Nikon range-finder. This was an early offering from Nikon. I later sold it and then bought a 35mm Nikon SLR (single lens reflex). We used 4x5 Speed Graphics when on Army photo assignments. The first sergeant was an Iranian with an American wife on base. He was returning to Iran on leave to visit his two Iranian wives. I gave him $750 to bring back any car he deemed a good buy from an oil sheik. He brought back a mint 1953 Mercedes-Benz Type 300, the largest Mercedes made that year. It had mahogany wood interior, a reservoir of oil for which you pumped a lever on the floor six times every six months to lube the chassis joints, plus a host of other luxury items. The best I can remember this car had the gear shift on the steering column. Both seats folded down. Like most European cars, there was a nice vase on the dash for fresh flowers. Another feature, there was a remote controlled shield that covered the radiator for winter driving. 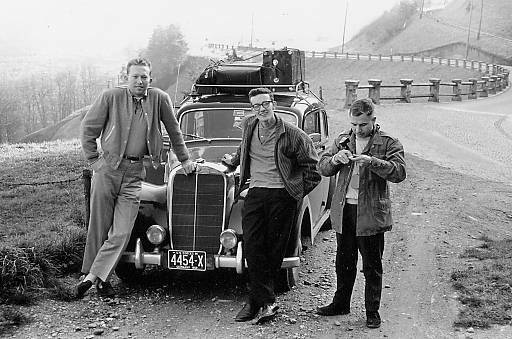 I drove it all over Europe for 11 cents per gallon on PX gas (Post Exchange on base) and 24 cents per gallon with Army ESSO coupons, except in Spain. Francisco Franco's brother-in-law owned all the gas stations at the time and we had to pay full price. When my tour of duty ended I sold it for $950 to another soldier. Their are many more stories connected with this car. My parents came to Europe for a month's visit and I toured them throughout Europe in fine style. I was stationed outside of Stuttgart not far from Sindelfingen. I know you will know that this was where the Mercedes-Benz plant was at that time. I was in the 97th Signal Battalion, which was located in the Panzer barracks which the famous Nazi General Erwin Rommel occupied before World War II. We had a curfew at 12:00 each night and since I was one of the few enlisted GIs with a car, different local beer gardens would call the barracks for me to come down and pick up friends which in most cases had too much to drink. I would often pay for the number of beers each guy would have had. The German waitress would mark the coaster for each beer sold and I would take the coaster back to the barracks and the next morning show my buddy so he could reimburse me. A flip top German beer was then a mark, or 25 cents. Secondly, when ever their was a big inspection of the barracks none of us had room in our footlockers so we stuffed the car full of odds and ends, right to the roof. At that time, there was a real distinction between a private and a commissioned officer. The Battalion Commander, who was a colonel, asked if I would take his wife shopping in Stuttgart, of course using my Mercedes. I replied, "Of course, but I have KP (Kitchen Police)." He said, "I can take care of that." If you were ever in the service, KP was the pits. So my beloved Mercedes got me out of KP some several times, while I chauffeured her around shopping and to her club meetings. She was a very nice lady who always said my car was much nicer than her husband's, and enjoyed shopping with me more than her spouse. Of course he never had to pull KP. I was a photographer and also on aerial status. I became good friends with several pilots and it was decided we would race from Stuttgart with the Mercedes 300 and a Cessna L-19 to München starting at 03:00 in the morning. The autobahn had no speed limits. The L-19 was a single engine two place observation plane called a Bird Dog. It had a high pitch propeller for short take-offs which gave it a slow cruising speed. When he took off from Stuttgart airport he radioed while we were sitting on the autobahn. When he landed at München he radioed and believe it or not we were all ready in the München city limits. Two sad things: As I mentioned, I was a photographer and the pictures I took of the car have been lost over the years and I did not have the foresight or money to bring this mint car home." February 19, 2003: updated with photo of Arnout's actual Type 220 taxi-cab. April 10, 2013: Discovered an on-line memorial announcing Arnout Hyde's death.